Ramesh is born and brought up in Mumbai. He had to leave his studies in the 8th standard when his father died due to illness. His mother worked as a patient’s attendant at Hospitals and Homes. He had to start earning a living before he became an adult. He attended night school to learn English. He’s washed cars for many years, even worked at a footwear shop, and delivered milk to help his Mother and family. He’s been selling milk around Hill Road and Turner road at Bandra west over 20 years. I asked him to tell me about a client who has been very kind to him; He told me, two of his nicest customers are those who helped him when he faced big problems. Once he suffered a paralytic attack and lost the use of his left hand and leg. A doctor, Ms Kulkarni, one of his clients, got him admitted to Bhabha Hospital and kept a daily check on his improvement, would visit him daily to meet the Municipal doctors attending to him. Then she made him go to a Parsi doctor at Mazagon who cured his paralysis in a month! Another good client, Mr Puri, who lives in actor Salman Khan’s building he says, often offers him tea early morning when he goes to deliver milk, and sometimes buys him medicines when he is ill. Thank you to Satya H, Priyanka S C and Advait, and Shashi C (Sai Seva), for jointly buying a new bike for Ramesh; Ramesh gave us in exchange his old bike, which we propose to give to someone who needs one to better his livelihood. Thank you Kohinoor Cycles Siddharth Vora for the good discount and service. Name: Mani. Age 63. Village: Kanyakumari. 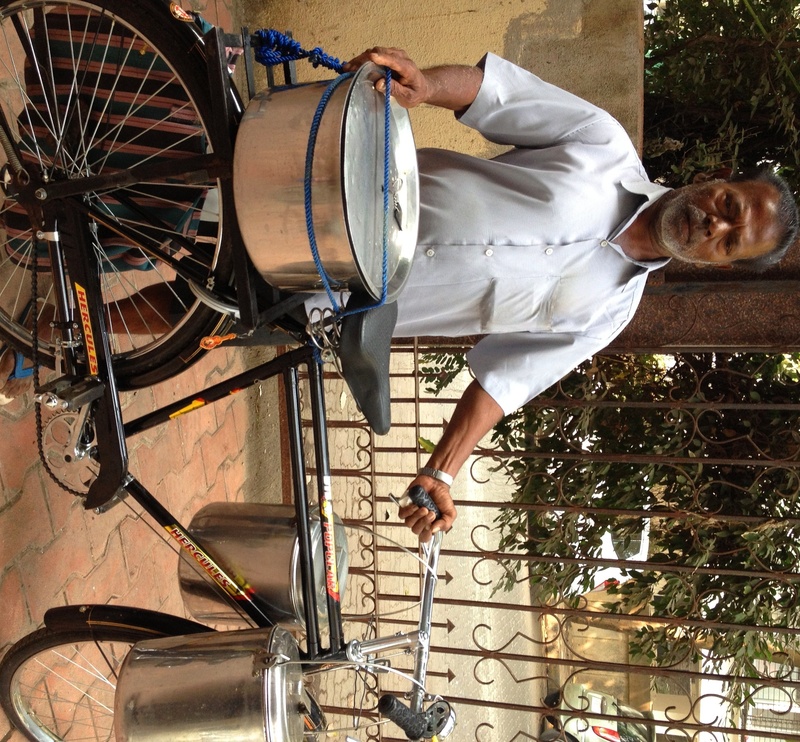 Mani wakes uo at 2am daily, even Sundays, to cook the idlis and sambhar and chatni himself! He has a son who works as an electrician with an electrical contractor, and his two daughters are married, and his one unmarried daughter works at Churchgate. Thank You Munish Aggarwal and Deepti Aggarwal, for donating a new bicycle to Mani; Mani’s used old bike we will donate to someone needy, I am yet to find that person. As he said this, I thought to myself… that is exactly how…. Profession; Malee (gardener) Age 50. Premchand arrived in Mumbai to earn a livelihood as his parents were unable to support him in the village, they were farmers. He has 3 children, one daughter is married, the other is in college, his son is in school; they live in the village. Premchand has been working as a gardener all his life. Ever since he was a child. He was working at actor Salman Khan’s building for over two decades, but when he fell ill in his village and was in bed for over 3 months due to Malaria and some other complications, he lost that job. Now he works at an Office Tower at Lower Parel as a gardener and sometimes needs a bike to carry his tools on the carrier, and riding a bike to work will save him time and money, he says. He mentioned in the past two decades 3 bicycles of his were stolen, even though he uses chains and locks always to secure them. I realized, once again, how vulnerable they are, those who do not live in spaces guarded by security services and CCTV’s. He replied, as a gardener he has to care for the flowers and plants giving them timely water, manure, sunshine, medicines, at the right time and in right amounts…. Thank you to Changez and Shyam Keswani for donating a new cycle to Das Florist; Das gave us his old bicycle in exchange which we donated to Malee Premchand. Thank you to Kohinoor Cycles/Siddharth Vora for the good service. Profession – Phoolwala – Florist. 21 years young Adak left his studies after the 8th standard 8 years ago, and arrived in Mumbai from Kolkatta, to earn a livelihood, as his parents (both are farmers), could not afford to educate him further. He has a younger brother. Adak’s day begins at 5 am when he travels to Dadar flower market to buy fresh flowers. He likes his profession because he gets to roam around delivering flowers (walking or riding) and decorating homes and offices during religious festivals or wedding events, or when people buy a new car, etc. He says he chooses to be a retailer selling flowers seated on a pavement as he gets to travel delivering flowers, rather than be a wholesaler of flowers stuck at one spot all day long, even though wholesaling will make him more money he prefers retailing and decorating places himself. The most challenging time he’s faced was when he arrived in Mumbai and could not find a place to live that he could afford. He says, luckily his uncle was running the florist shop on the corner of perry cross road and turner road, and he handed Adak the reins of the nearly 15 years old florist business and went away to the village; Adak has been running the pavement shop since then. Back in Kolkatta, when Adak left school due to poverty, he worked with a florist in Kolkatta for a few months and learnt the trade of being a florist. I asked him what was his biggest suffering when he arrived to a new city without money; he replied he missed his home and parents and brother the most when he arrived here, and that was the biggest suffering of those initial years in Mumbai. It made me realize once again that a man, or woman, leaves his village, his place of birth, with such a great sense of loss of that old world, his HOME. I asked him, because he sells stuff on a pavement are there some regular problems he faces; he replied, the biggest nuisance he faces are from the ‘hawaldar’ level cops who do not pay for the flowers they take from him. However the high ranking police officers insist on paying him each and every time they order flowers, and they never take flowers without forcing him to accept their payment! So he has high regards for the high ranking police officers of Mumbai. I asked him who has given him the most respect even though someone may treat him like a ‘just a phoolwala/ flower vendor’ ; he replied, the one person who has given him the most respect, even though he is just a ‘phoolwala’, flower seller, is, actor Anil Kapoor’s mother, and someone from Anil’s family who lives on perry cross road. When he visits Anil Kapoor’s Mother’s house at Lokhandwala for flower decorations or flower delivery, she always makes it a point to ask him how he is and advises him about life, tells him hard work is the only way to a better life and happiness, offers him water,, etc. Adak paused when he said this, his eyes had turned moist as he looked away in the distance, as though he saw her kind face right then in his mind’s eye, I felt. Thank you to young Changez (our youngest donor so far!! !, donated from his first job’s salary) and to his dad Shyam Keswani, for donating a new bike to Adak; Adak gave us in exchange his old bike which we will donate to some needy person, most probably to an old gardener I have met. Thank you Kohinoor Cycles, Siddharth Vora, for the good discount and service. Age – He does not know. 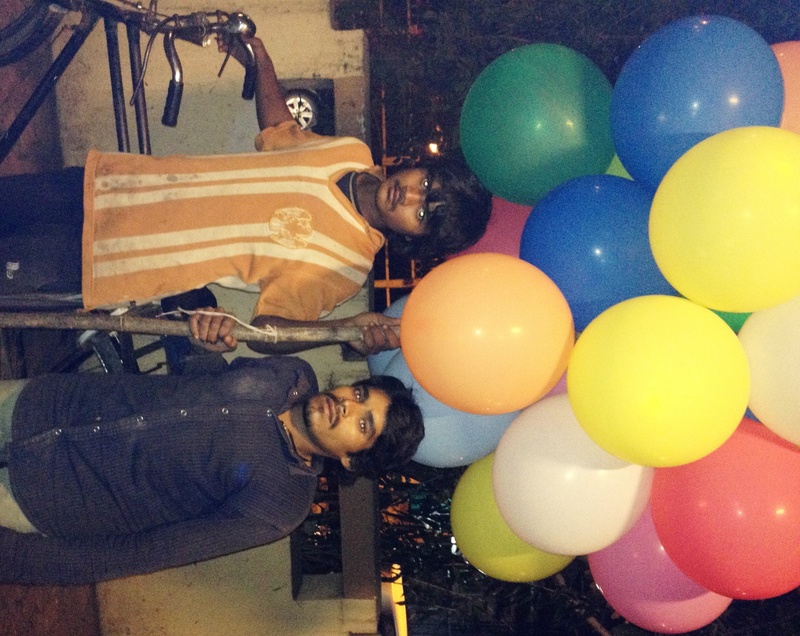 Uneducated, Teja arrived in Mumbai less than a week ago, he sells balloons to earn his livelihood. His friends from his village, who arrived in Mumbai much earlier than him, also sell balloons (and incidentally, Mithulal, an earlier young recipient of a used livelihood bicycle, is Teja’s pal and is also from Rajasthan, and they all live under the Bandra flyover on the pavement.) I found out because Teja mentioned how happy Mithulal was the day he arrived home, which is under the roof of their flyover bridge, with a bicycle to help him sell baloons! Teja’s uncle, a hunchback, sells balloons and is his guardian, and he is standing in this photo on his left. When Teja said ‘small’, he bent down and took his hand down to his knee demonstrating how old they are, meaning, how young they are is what I gathered by his innocent way of defining their age; someone defining age when he does not have or know the concept of “BIRTH-DATE-DAY” being illiterate!. He continued – ‘I walk all over and sell balloons, and I look for children wherever I go, and I go closer to them in the hope they will buy my balloons. On a good day I make Rs 400 or 500, and on a bad day I make around Rs 100. Thanks to Zulekha Shariff and Atif Parkar, because they donated a new bike to Rajkishore Varma, the beedi paan seller, Rajkishore gave us his old bike in exchange for the new, and his old bike we donated to young Teja. Thank you Kohinoor cycles for the service. 1) 1st recipient of livelihood bicycle. Name of 1st livelihood bicycle recipient: Mohamed Ismail Shah. Ismail uses a bicycle to carry his tool box and other stuff like pipes etc, on his bicycle. He is from UP. His bicycle was stolen last week and had been walking home to home since a week. I chanced upon him today. He lives in Ulhasnagar, travels to Khar west, 15th road, daily, since 1984, to work as a household Plumber. The livelihood Bicycle donated to him: Atlas. Frame no. MG493526. Wish Ismail all the best. Purchase cost of bicycle: Rs 1800; purchased from used-cycles seller Babulal. (Babulal has a shop on 15th road, Khar west) Babulal dropped the price by Rs 200 when he was told some privileged and kind people have paid for this donation. Date of donation: Sept 25th 2013. Chaurasia Bhelwala’s dream is to educate his son Nitesh beyond college and not make him a Bhelwala like he is. Nitesh is studying in the 6th Std at Thakur Vidya Mandir School, and needed a bicycle to ride to school. Nitesh helps his father delivering bhel home to home on Perry Cross Road post his school. He says he can now use the bicycle to do that faster and reach more homes and earn more money for his family. Cheers to Nitesh and his father. Rajendra vedors tea and coffee around Carter road, Bandra west. He says he’s arrived in Bombay 3 days ago, both his parents are dead. He lives and works with a man from his village who runs the tea shop near Carter road, next to the Police Commissioner’s office on carter road. Bicycle purchased and Donated by – Shekhar K.
3) 3rd recipient of Livelihood bicycle. Tea seller on carter road and Perry cross road since a decade. He walks the area delivering tea to all watchmen and shop keepers around the area covers Pali Hill market and beyond. Never owned a bicycle before as an adult. Cost of donated Atlas bicycle (Frame no. 603330HM) Rs 2100. Newspaper vendor since 10 years; (Hear this out – Bagdi supports his parents, wife and two kids from this one job!!) He delivers newspaper in Rizvi college area, and other areas, from 4am to 12 noon. This is the only job he has from which he feeds 5 beings! He was recommended to me by my newspaper vendor, Lau Paudwal. Donated by Surabhi Shah. Manish. Lives near Madh (Island) village. Travels to Versova and Andheri daily for his profession. Recommended to me by my domestic help’s husband, since Rajesh is his barber in their neighborhood at Versova. “I was always fond of cutting hair, since childhood, because my father’s brother was a barber. The first time I cut someone’s hair was when I was 18, and I loved it. Since then, nearly 25 years or so, I am a barber. I support my parents and wife and two children who live in UP from this profession. My kids go to school. Thanks to the bicycle I will reach more places, cover a larger area from tomorrow, and I will save Rs 16 a day because now on I will ride to work from Madh via the Ferry service, and I plan to send this saving of Rs 16 a day home to my family in UP. 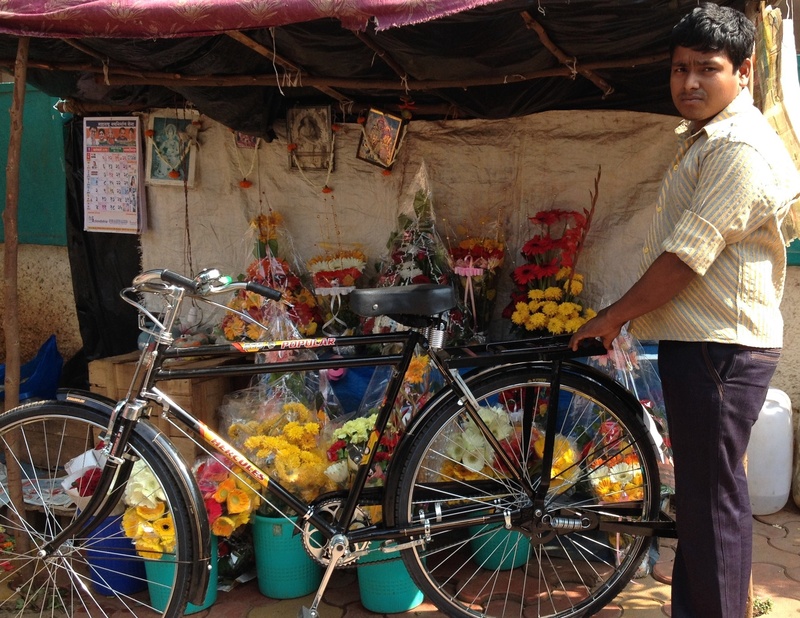 People who gave me this bicycle, tell them ‘Shukriya” – Rajesh. Bike donated: Atlas. Cost Rs 1850. Rama walks from Dharavi to Vile Parle west (daily), to sell Idli’s to a woman who feeds idli’s worth Rs 1000 daily to orphans. Then he takes a bus back to Dharavi, refills his vessels, and then walks to Carter road, Bandra west, and hangs on carter road from noon until 4pm, selling Idli’s. Then he goes to another area nearby to vendor his goods. Hereafter, he will ride on this bike, he says. He earns around Rs 500 a day, and on Sundays or public holidays he earns around 900 to 1000. From this, he is educating his 3 kids and looks after his wife and parents, at Dharavi. Bicycle donated by Kabir Wadhwani. Cost of Atlas bicycle Rs 2300. Just how selfless and content is Sirtaj Mian, I thought as he rode away, and I walked and whispered towards him ‘Khuda Hafeez Sirtaj Mian. You are the true rich man amongst many poor people. For me, this man has understood what God, what religion, both really mean. And his knowledge and understanding of them is not because he seems to be a devout Muslim; it is because such a man is a man who belongs to all religions! Moreover, even if he were to be an atheist he would be someone any God would believe in!! One and a half arm, yet, a determination to work even longer hours and even harder than many who are more complete. Abhishek works for a tea Vendor at Pali Naka, Bandra west. He arrived in Bombay 6 months ago to earn a livelihood. He is 12th standard school educated. How often does a velo enthusiast, an avid rider, DONATE his bicycle….? … A 15 gears bicycle, a Raleigh MTB, which he rode and maintained affectionately for nearly 8 years, although he had a Trek MTB alongside…. Further, he, Parvin, even got his Raleigh MTB SERVICED before he gave it off, like a most valuable and dignified gift, to this boy, Nitesh. (Actor, scuba diver, deep sea photographer…) Parvin Dabas (aka Parvin Dabbas), donated his beloved Raleigh MTB to Nitesh Chaurasia (Nitesh’s father sells Bhel…), so that Nitesh can travel to School on a bicycle, and save daily bus-travel money. But it was cumbersome for them to take the bicycle up and down in train from Nalasopara to Bandra daily, so last week Nitesh returned the livelihood bicycle we had donated to him, so that we can pass it on to someone who needs it for livelihood purpose. Parvin felt Nitesh deserves the gift of his MTB and so I made them meet. Parvin, though a good acquaintance, was recommended to me by avid rider Maha Dev, when Maha Dev fopund out Parvin wants to donate his bicycle. Harendra Yadav. Newspaper delivery man, since 1995. Arrived in Bom from UP in 1995 and delivering newspaper since then. Yadav’s bicycle was stolen a few months ago, and since then he’s been delivering newspaper on foot in bandra west area, Perry Cross road too. He lives in Sion. He could not afford to buy another one again, as he just could not spare the money, reason – his son suffered an injury to his head three years ago and the medical care he continues to require even today saps Yadav’s savings. Shekhar donated this bicycle to him, and he was glad the exchange happened today, of all days, because today is wife Anjali’s Birthday, and he wants this livelihood bike to be her gift to Yadav to make her birthday day super special. Shekhar had purchased this bicycle a month ago and was waiting for a deserving person to give it to. Thanks Shekhar, especially because this is the second bicycle you donated. Some years back, Vaishu (name changed) was a dreamy- eyed teenager pursuing a diploma in fashion design. Her ambitions came to an abrupt halt when her elder sister eloped and her parents became very anxious that history would repeat itself. Under great family pressure, Vaishu was married off this year but she found herself very unhappy in a household which forbade and restricted her from pursuing her studies. Though Vaishu had heard nothing that we haven’t heard before, with nowhere to go and no means for financial independence, she decided to take matters into her own hands. She packed her luggage, announced her decision to her husband and headed where her self- preservation compass pointed too. She sought sanctuary at Urja, a home for runaway and homeless girls in Dadar. Vaishu is interested in dancing, she likes learning all type of Indian and western dances. She approached Urja with a view where she can learn all type of dancing and make dancing as her earning source and fulfill her dreams, hence she has joined the Panchshil institute which is located at Ravindranath Natya Mandir,Dadar (West) and that place is 7 km far from Urja by walk, so it is really very convenient for her to reach dance institute by bicycle instead of walking and she feels physically relax and healthy, her energy is also not wasted hence she can utilized the time for some other activities. Thanks to Surabhi Shah and Richa Pallod for donating this bike to Vaishu. Thanks to Shekhar Khobrekar for volunteering to deliver the bike to the NGO from Bandra to Dadar on his car rack. Read on, if people interest you, and I will willingly explain how I convinced Sirtaj Mian to accept the donation of a brand new bicycle! Before I go off FB for almost a week from this weekend Sat, I thought I must post this particular development about Sirtaj Mian’s new bicycle gift. My good pal Bhavesh Dhruva wanted to donate a brand new bicycle to any needy person who needs it to ply his trade, and he sent me the money for the same. I pondered for two weeks about whom to gift a brand new bicycle …. Hmmmmm because this was the first new bicycle we were going to purchase, from the funds I received from Bhavesh and my dear pal Raman. Earlier to this, I was only buying old bicycles that were costing me around Rs 2100 for one in good condition, worthy of donating. Kohinoor Cycle store offered me a special discount and I could buy a new one for around 4000 – 4400 depending on the weight carrying capacity of the accessories on the bike. The only most deserving person, so far, from my little experience in this initiative, who figured constantly in my mind was Sirtaj Mian. Maybe because he had refused two attempts I had made, spread over three weeks, to help him. So, I knew it would be a bloody challenge for me to convince Sirtaj Mian to accept a brand new bicycle donation!!! To try and convince him, first of all I did not address the deed as a ‘donation’, like I had on two earlier occasions. This time I addressed the deed I wanted to do for him as a ‘reward’; A reward for him for refusing the two attempts I had made to help him. Then, further, once I was confident he is certain it is not a ‘charity’ being offered, I told him I am willing to give him a brand new bike only on the condition he give his old used bike to me. Again, I enforced a ‘condition’, and made him feel it’s not for ‘FREE’. 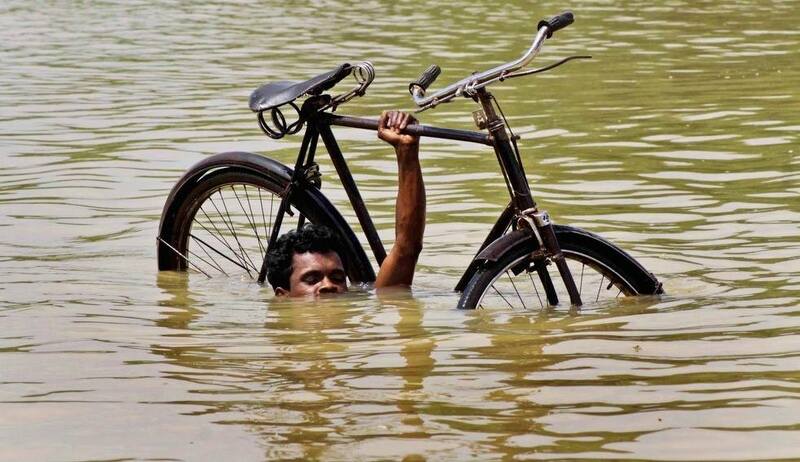 I told him, ‘If you want me to help someone, first you help me find a used bike. They are rarely available. And since a new bike will cost me around Rs 4000, if you give me your used bike in exchange for a new bike I can donate your used bike to someone who does not have a bike. That way, you get a new bike and someone ‘not as fortunate as you’ gets a bike too, your old bike! And, if the new bike costs me Rs 4000-4400, an old bike in good condition anyways costs me around Rs 1900 – 2100. To assure him further of our honorable intentions, I assured him I am okay if he brings someone needy to me who needs a livelihood bike, and I will hand over his (Sirtaj’s) old bike to that very person of his choice. Or, if he knows of no needy person, I will hand his old bike to someone of my choice, or the choice of my friends who sometimes have offered to look out for needy people now and then on my behalf. I think only then did Sirtaj Mian trust me with this weird sounding deal I offered him. He realized that this time, other than just him alone, someone else will benefit from him receiving help, a new bike was just incidental. I think, it did not really matter that much to him that it was a new would receive, at least he did look or sound excited, but he was lost in deep thought. However, I think I saw a slight SMILE on his dry and paan stained lips. He replied to me ‘Saab, woh to beimaani hogi, uss aadmi ke saath jisko meri purani cycle aap denge. Hum jaise humari cycle chalate the, hum usse waise hi aapko dena chahate hain. Hum ek nayee bell khareed lenge, apne paison se.’ That’s when I offered him Rs 100 to contribute to the cost of a new bell. He accepted it. Then I told him, the bike is brand new, but if he feels the tyres, carrier and stand, that I have purchased for it cannot carry his load of bread, the two donors will be most willing to buy him a stronger stand, stronger or bigger carrier and 10 ply tyres. As he was getting ready to leave, I asked him how does he feel receiving a brand new bike? Then he pondered, and said, ‘Ek aur baat hai Saab; Aaj Zindagi mein pehli baar nayee cycle chala raha hoon. Aaj tak kabhi himmat nahi ki ek nayee cycle khareedne ki, kyunki bacchon aur ghar ke liye do paise jodhne mein hi zindagi nikal gayee purani cyclelon par pau bechte bechte. Aapne humari poorani cycle humare samne hi ek humare jaise hi insaan ko daan kar di, humko yeh baat bahut achi lagi, ki jo cycle ne humare ghar ko chalane mein humari itne saal madat ki, woh purani cycle ab kissi aur zarooratmandh ke kaam aayegi. Thanks to my dear pal Bhavesh Dhruva for agreeing to gift a new bike to Sirtaj Mian; and for understanding that at the cost of one new bike he will eventually be donating two. And thanks to my pals Raman, Kabir, Ambi, Ashish, Bambi, too for contributing to this very special purchase. At least very special to me and them. Coconut Seller to be. He will begin this profession, selling coconuts, delivering them to people’s homes in Bandra, Khar, from today! He’s 15 years young. He was recommend to me by Sajan Akram Shaikh, a coconut seller on Carter road, they are best friends and from the same village. Taffajul is from Paranpur, Jharkhand. He is 10 days old in Bombay. His father died two years ago. He is here to support his mother and two younger brothers back in Jharkhand, both study in school. He left his village because every year the annual floods along the banks of the Ganga destroy their crops and land. Every year they begin from minus zero. How long can they live like that, he said, and he decided to leave home and work in Bombay, leaving behind his family and even his school studies, educated till 7th Std. The best moment of this event today: Sajan and Toffajul brought me two huge coconuts as a gift, because he wanted to give me something in exchange for the free bicycle he was receiving. Lesson – Gratitude is not dead in even those below the poverty line. Santosh Chaurasia. Paan leaves (Betel leaf) Vendor. He lives at Null Bazar, travels to Bandra by train daily to sell Paan leaves in Bandra and Khar areas. Carries 30 to 40 Kgs weight on his bicycle. He agreed to give us his old Atlas bike in exchange of the brand new Hercules (donated by Minnie Mehra), so that we can donate it further to some needy vendor who does not have one. Thank you Minne Mehra and her activity centre for kids – Miniland Playgroup Nursery & Activity Centre, Juhu; for this wonderful donation for Chaurasia. (Thank you Gazi Ali for delivering the bike to me. 14th recipient of livelihood bicycle: The successful marriages of his 6 sisters devastated his father’s/family’s livelihood. Cigarette vendor since 5 years. Originally from Jaunpur, UP; Lives at Mahim, came to Bombay in search of a livelihood 12 years ago, when his father went bankrupt due to the loans they had to take and shut the only shop they had just to pay dowries for his 6 daughters marriages, they lost their only source of livelihood. Manoj now vendors Cigarettes in Bandra west; his 4 kids go to school and supports his family and his parents. He agreed to give us his old Hercules cycle in exchange of a new Hercules donated by my pal Minnie. He agreed to put a new tyre on his old bike before giving it to us as it was nearly bald. His old bicycle will be donated soon to mostly a newspaper vendor known to me since many years. Thank you Minne Mehra and her activity center for kids – Miniland Playgroup Nursery & Activity Centre, Juhu; for this wonderful new bike donation for Manoj. 15th recipient of livelihood bicycle: Another selfless man. Newspaper vendor in Bandra west. Lau has been delivering newspapers to my residence since over two decades. Not once has he ever asked me for Diwali-Bakshissh. He has rarely been late by more than 15 mins. He has two kids, one, his daughter, goes to school and his son is on college. He has been a newspaper vendor since his SSC; he is just SSC pass. Two months ago when I was looking for needy people who we can donate old or new bicycles to, I asked him for help, I told to put me in touch with people who do not have a bicycle of their own, or who ride bicycles belonging to their employer, as we are in a position today to give a few such people used old bicycles to make them independent and to help them earn their livelihood. Last week once again I asked Lau for help in making me meet some needy people who do not own their own bicycle, or who who not ride one belonging to them, and we can give such a person an old used bike to help them earn their livelihood. Lau suggested to me a man from his neighborhood, who delivers newspapers in the morning and he said his son will ride the bike to college in the day. I agreed to donate the bike to that person. I asked Lau if he would like it if I gave him an old used bike which he can keep for himself so that he can be independent of his agent. Lau said he can manage with the one his agent has given him, as his friend needs one more than him because his son will also be able to ride it to college in the day time post newspaper delivery. That’s when I decided, lau padwal is the man who deserves this old bike more than anyone else right away! We can always give his friend the next old one we receive in exchange of a new one we donate. Somehow, I felt we must reward selfless Lau, in this tiny manner. After a bit of hesitancy, Lau agreed to accept the bike. I assured him we will give his friend too an old used bike later as and when we receive one. Thanks to Minnie Mehra for this donation, this is the third bike she’s donated; actually, this old Hercules bike belonged to Manoj Jaiswal, the 16th recipient who she donated a new Hercules bike to in exchange of this old one that Manoj rode for nearly 5 years vending cigarettes. 16th recipient of livelihood bicycle: A man who has not seen his wife and two kids for very long. Today I saw a man walking on the pavement, collecting something from the bushes and putting it inside a big blue carry bag. He had many large blue color carry bags, all full of some stuff, some were hanging on his shoulder, some on his arms. I stopped him and asked him what does he do. He told me he collects junk and plastic bottles and sells them. I asked him since when has he been doing this. He said he’s been doing it ever since he stopped driving an autorickshaw. 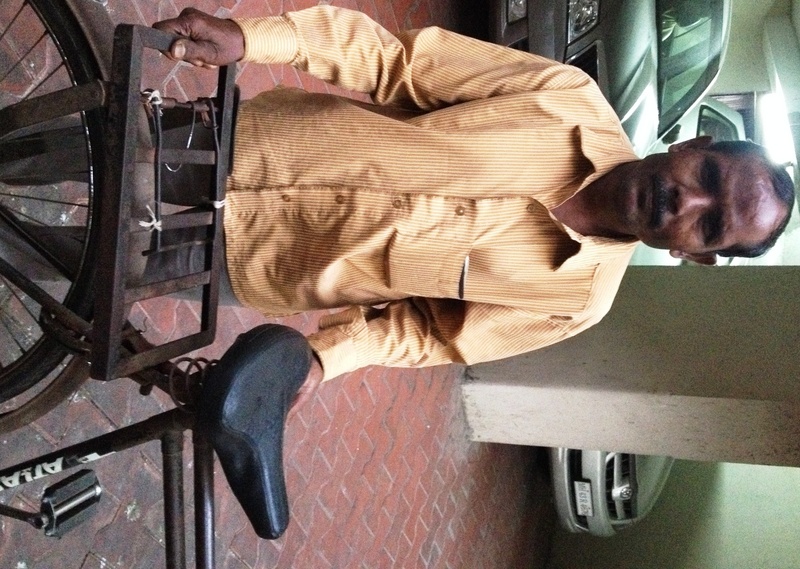 His story was… around a decade or more ago he was an autorickshaw driver. Someone stole his cash bag and along with that he lost his driving licence. The RTO agent asked him for rs 3000 to get him a new licence. He did not have the money so he could not get another driving licence. He took on some odd jobs and has been on and off odd jobs since then. His wife left him and along with his two kids returned to her parents house as he was unable to support her. Not able to find stable job and income he began collecting discarded water bottles of plastic by evening and does this all night long until dawn almost. Then he sells them to the kabadiwala daily and thus earns his daily meals. His wife does not accept him anymore in this form, as she had married a man with a stable profession (rickshaw driver) and not a rag picker, so she left him because he cannot provide for her and her kids anymore, whereas because her mother can continue to support her she chose to stay with her mother since a decade nearly, ever since he lost the autorickshaw driving licence. I asked him, if I gave him an old used bicycle, what will be do with it, and how will it help him. He then proceeded to touch my feet, and i immediately moved them out of his reach. I told him if you want to reach for something reach for the cycle we are going to give you now, and don’t look back at picking up trash discarded by people and homes. I can only hope you can find a good livelihood hereafter, and someday ride home to your wife and kids whom you have not seen in over 9 years, take your kids double-seat on its handlebar, make her sit behind on the carrier, see them again with some degree of pride in yourself. Thanks to Minnie Mehra for this donation, this old used bike we received in exchange from Santosh Cahurasia whom she donated a brand new bike last month. Bashir Ahmed Khan (Pappu Bhai Andewala) is from Pratapgadh, UP. He arrived in Bombay as a child in 1988, his father was an egg seller too. He is educated till the 8th std. He has been selling eggs since more than 10 years, he has 3 daughters and one son, all go to school. His most challenging period was when his father died, he had to take over the selling of eggs profession his father did ever since his childhood. The biggest crisis he’s ever faced so far was when he had to take a loan to help his two sisters get married. It took him a decade to pay back he says, by selling eggs every day of his life. His mother keeps unwell, so the challenge to educate his 4 children and help settle his brother and look after his ailing mother are his daily crisis along with negotiating traffic with 40 to 50 kgs of Eggs he carters daily 7 to 8 kms of riding daily in and around Bandra and Khar. Once a four wheeler vehicle drove right into him, he says ‘Khuda ki rehmat I survived the crash and fall, my poor eggs didn’t!’ His sense of humor, despite his total loss that day, made me laugh as he smiled saying that. As he rode away, balancing at least 2 dozen egg trays on his carrier, I thought – Thankfully, he’s not as fragile as the eggs he sells. 🙂 And I wished many of us be stronger than eggs 😛 ; We be as strong willed and humorous as Pappu Bhai Andewala. Thanks to my pal Sydney Benjamin, Yogesh Shetty, Minnie Mehra and Murali Krishnan, for pooling together their resources and buying Pappu Bhai a new Hercules bike. Pappu Bhai gave us his old Hercules in exchange of the new one we donated to him, he was kind enough to agree to giving away the new tyres from his new bike so that they can be placed on his old bike, so that the poor person receiving his old old bike gets new tyres, it was his contribution to this exchange, because his old bike’s tyres were in good condition so he did not mind putting them on the new bike. Pappu’s old bike will soon be donated to someone who needs a bike for his livelihood or to save money on travelling fare to his place of work. Mera chota ladka Agnelo Asharam School, Band Stand, bandra, main padhta hai. Uski fees hai 100 Rs har mahine. Priya Sunil Datt ji ne uska dhakala wahan karaya. That’s what he pleaded with folded hands, when I stopped on my ride to ask him if he would like his crooked front wheel, and all three bald tyres to be changed for free. I told him I am unable to find him work, however, we can help him by giving his 3 wheeler a new lease of life, straighten his crooked front wheel (rim), and a set of new tyres. I have received funds from some pals to buy a livelihood bike for a needy, and some pals have promised me funds in the coming weeks, and I wish they will not mind if I buy this handicapped man (Polio affected since childhood) new set of tyres and repair his 3 wheeled bike from the money I have and will be soon receiving from them for a livelihood bike. I asked him how does he manage to pay his sons fees of Rs 100 a month if he has no job? Later in the evening, as I was driving past a place of worship near my house on my way to a friend’s wedding at Turf Club, Worli, I saw him with his hands outstretched outside the place of worship. Then I knew, this father can even beg to pay his kids school fees. I liked that he (even a jobless man) is educating his DAUGHTER and son. And when I ride my expensive gear bikes, I know how difficult it would be to ride my bike if the wheels were bald and if one was crooked too. I have two legs to move mine ahead; he can use just one hand to do that same job. His name, Ajit Bhanu Goel. Trade – Kadia – Mason. daily wages worker. He was once upon a time an EMBROIDER. He was an embroider (has worked on sarees, ghagra choli, etc) from childhood until seven years ago. Since seven years he is a Kadia/Mason in Mumbai. “I hope you are not snatching someone else’s happiness and handing it to me” ….. Yes, That’s exactly what he asked me very sincerely, when I handed him this old/used bicycle that we received in exchange of a new bicycle we donated to Pappu bahi Ande wala. I asked him what does he really mean by that! I could not believe he asked me that. It took a while for me to recover, as I did not have a reply to something I could not fathom is innocent curiosity or sincere doubt. Hmmmmm Maybe people at his status are denied there rights too often for them to believe that someone can give away a bicycle just like that!, a cycle belonging to an undeserving employee or an ex-employee, I can only guess why he must have asked me that. I laughed and told him this has been donated by an egg seller to whom we donated a new cycle. I explained what we do for people like him who need a bike to work or to commute to work. He is from Calcutta (Kolkata), Khiddipur village. His father is a farmer, and since childhood he has known only how to embroider clothes. He says he is superb at embroidery. But, because he had differences with his family over money matters and work, he left Calcutta and arrived in Bombay to work as an embroider. he worked at some units in Khar east and Malad, but was not being paid well, and left to work for daily wages. He found employment under a contractor who offered him a job as an assistant to his senior Mason/Kadia, 7 years ago, and now he is a mason. He can lay paver blocks, tiles, etc. He speaks Bengali and Hindi. He cannot read nor write. The sad thing, he has no ID on him, no cell phone. He told me tomorrow he will give my gateman his boss’s cell number who lives in Bandra west, near Rizvi. Trade: Washes and Irons clothes. His father was a dhobi. His two sons (both married, live with him) are dhobis too. Village: Rae Barellily. UP. In Mumbai since childhood. Lives in Bandra west, Bazaar road. His old bicycle, the one he gave us in exchange of this new one, is nearly 40 years old he told me! Thanks to Prabhjot Gill, for donating this new Hercules to him. Thanks to Sriram for agreeing to spend Rs 800 and repairing his old bike and making it more worthy for us to donate to someone needy. Thanks to Siddharth Vora of Kohionoor Cycles for the discount. Thanks to Gzi Ali for his good service. Recipient of bicycle – I like that they fly up in the air. I like that they are colorful. He arrived from his village on Dec 12th 2013. Their mother died during childbirth four years ago. Their Father is unable to provide for them. His elder brother, his guardian, settled in Bombay since a few years, sells Balloons; he has an adult size bicycle on which he ties them and carries a hand pump along to fill air in balloons. I asked him and his elder brother (who must be 14-15 years young), where do they live in Bombay? He replied: Under the Bandra flyover. And that’s where we sleep too. I asked Mithulal what does he like about the balloons he sells. He replied, – I like that they fly up in the air. I like that they are colorful. Today when I sleep on my bed, I shall say a prayer for these two parentless and vulnerable boys out under a flyover. Suresh came to Mumbai a few months ago to work as a domestic help. He is married with two daughters and they live in Jharkhand. His wife is expecting their 3rd child in a few weeks. His employer told him to leave the job when he did not return from the village within the time he had committed; he admits he has been a bit irresponsible on that front even though he went because he had to attend to his wife’s medical care. He’s learnt a lesson he says, as he has been jobless since a few months and without any savings, so he began selling tea on foot since then to support his family. Both his kids are in school and he manages to pay their fees by selling tea. He is also sending money to his wife from this trade. I asked him, ‘Which has been the most challenging time you ever faced, so far in your young life?’ (He is 30 plus I think). I asked him, ‘What was that amount, your life savings, which you say you spent completely on your wife’s cure? I told him someone else, Prabhjot Gill, is the one he should be offering this loving hot cup of ‘tea of gratitude’. Thank you Prabhjot Gill (and Dhobi Sriram Jagneshwar) for this donation. Thank you Gazi Ali and Kohinoor Cycles for the repairing job you did on this bike. He arrived in Bombay from UP as a child, worked in a Bakery. His father died when he was a child, his Mother and maternal uncle’s brought them (him and his brothers) up. The job he did making bread in a bakery was not earning him enough, so he began to deliver/sell branded bread to shops in Bandra west on a bicycle. That became his livelihood. He lives in Mahim. Rafiq’s most difficult time in his life was when his father died when he was a child. He could not educate himself and had to learn how to bake bread in a bakery. His most challenging times began after he got married, and continues to date, because his wife has a heart ailment since a decade and most of his earnings go in her continued cure, nothing much is saved as ‘Savings’. He earns enough to educate his children. Thank you to Dr. Niraj Vora for this donation of this new bicycle for Rafiq. Rafiq gave us his 5 years old bicycle in good condition in exchange for this new Hercules, and we will soon donate his old bike to someone who has none and needs one. It was donated to a young plumber from Ulhasnagar, whose details I will post soon. Thank you Kohinoor Cycles, Siddharth Vora for the good discount; and Gazi Ali for the good service. Profession: Plumber. Lives in Ulhasnagar. Travels to Khar west daily by train to work as a freelance plumber. He needed a bicycle to carry his trade tools box and water pipes on and off. Ayub is from UP. His father was a plumber in Bombay, and when he died an early death, 12 years ago, due to Malaria, Ayub had to discontinue his studies back in his village and come to Bombay and earn a living. He took to plumbing as his village friend in Bombay, Ismail, (the 1st recipient of these livelihood bicycles) was an established plumber and willing to mentor him. Ayub found it very hard to learn plumbing as he was doing this profession against his wish, actually he had wanted to study further till college, but lacked money to continue. Plumbing, though an un-glamorous profession, is a highly skilled job of high responsibility, he says, so I worked very very hard to pick up skills that I never wanted to learn, never wanted to be, while I was studying. Other than that, he says, the most challenging times he has ever faced were when his father died and he had to support his family and came to Bombay without a place to stay and no money to have even 3 meals daily. Thanks to Ismail Mohamad the plumber on 15th road Khar west, his village pal, though much older to him, (Ismail is the 1st recipient of these bikes), Ayub slowly over the last 12 years has picked up the skills and he says he is now good at his job. Ayub is married and has 3 children all in school back in the village. Thank you to the bicycle angel Dr Niraj Vora, because he donated a new bicycle to the bread seller Rafiq, Rafiq’s old bicycle was given in exchange to Ayub, who had none and needed one since over a year but could not afford to spare money to invest in even a second hand bike. I must add here, that many of the people I met told me their most difficult time and their reason for leaving their village was the death of their father. It made me realize, if the women were literate and working, the children could have been supported by their surviving Mothers. Most of them said their Mothers were not earning members, and this reflects the need for more women to become literate, so that the family does not necessarily crumble on the father’s/husband’s death. Just a thought I got. Thank you Kohinoor Cycles and Gazi Ali for the good service. Trade: Cigarettes and Biscuits vendor; vendors them in Bandra and Khar west. Village: UP. Currently resides at Nalasopara. Rajendra is the eldest in his family, he has a younger brother and two younger sisters. Until 4 years ago he was working as a farmer in the fields belonging to landowners, as a daily wages farmer. His father is working as one even currently. I asked him, what has been the most challenging times he has faced so far. Rajendra’s reply: ….. (Thinks) ‘When my father did not have money to pay my school fees, and I had to leave studies. I joined my father to work in the fields thereafter. I feel sad I could not educate myself, could not even complete school. (Pauses) We are not land owners so we have been working as farmers on land belonging to others. Yet, the money we were earning was never enough as we daily wages workers. My grandfather is alive so I have to take care of his too. Four or five years ago, I told my father and mother, that I cannot do this kind of farming work any longer, because if I do then how will they get my two sisters married, and how will they pay for their education to begin with, when they could not afford to educate me. I wanted my younger brother and sisters to do what I could not, complete school and be educated through college. So whatever I earn selling cigarettes shop to shop in Bombay, I keep enough from my survival in Bombay and the rest I send home to my village. My three siblings go to school. I want to get my two sisters married too. I left my village and home as I am the eldest and I felt responsible for all those younger and older to me in my family. 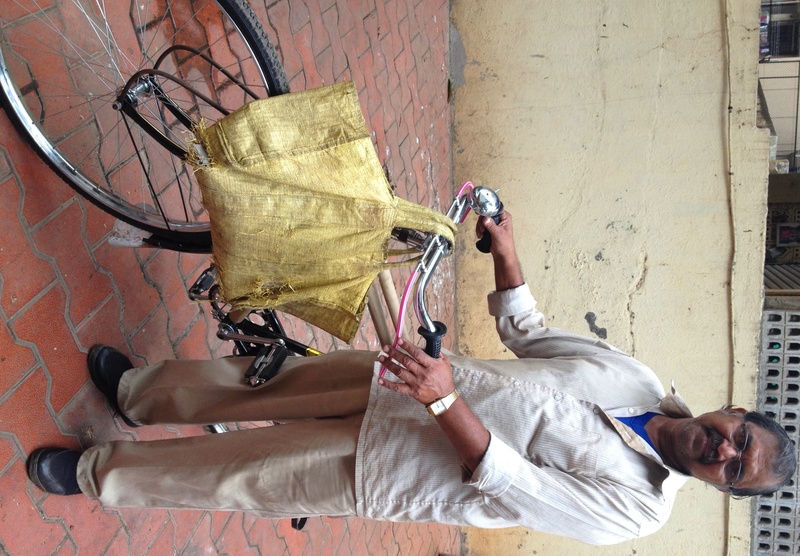 Thank You to the bicycle angels Bhavna and Sheetal Talwar for the donation of this new bicycle to Rajendra. Rajendra gave us his old used cycle which we will donate to someone who does not have one, and needs one for earning a livelihood or for his self transportation and save travel costs to work. Thank you to Siddharth Vora/Kohinoor Cycles for the discount on this bike. Thank you Gazi Ali for the good service. Village – Ahmadabad. Gujrat. In Bombay (mUmbai) since 2 days. Naresh migrated to Mumbai two days ago, is currently jobless. He got married 5 years ago and has one kid around age 1 or 2. Both his parents died due to alcohol addiction. Since then, he says, his nightmare of a life began. He has been brought up in the outskirts of his village by other homeless people; they became his family. Since the age of 6 he has been doing any kind of work which can bring him food. He worked for many years making threads from Cotton in a Thread manufacturing unit but being paid only Rs 90 or 100 -150 a day he left the unit and does freelance daily wages work. He told me there are days he eats just one or two meals only in 24 hours. He said if we give me a bicycle, he can pedal some kind of wares and ferry his wife and child, as she gets tired walking all day long with their child in her arms. He wants her to have some rest while he looks for work riding around the city, with the hope he can use the cycle as an asset to find some work faster. He saw people selling balloons and brooms on a cycle and can do that kind of trade too if he has one. Thank you to bicycle angels Bhavna and Sheetal Talwar, for buying a new bicycle for Rajendra Yadav the cigarette seller. It was his old bike we donated to Naresh and his family of 2. My youngest bicycle angel! 🙂 24!!! My family friend, in fact, he’s family. Known him since he was as high as my knees, now an advocate; Volunteered his contribution for a new bike from his salary, from his first job. Love. Thank You for donating your personal bicycle to someone special to me, my gardener, (Rajendra Bhosale), who has served me loyally since a decade. Your gift of the bicycle, and that of your friendship, both will remain special to me. Bon Voyage, Farewell my friend. Regards. Subsequent recipients … continued in next post dated Jan 12th, 2014. Trade – vendor of Paan, beedi, supari in Bandra and Khar west. Rajkishore migrated to Mumbai in mid 1980’s because their land could not provide crops enough to feed and educate his family, he has been selling goods on a bicycle ever since. He has two sons, one is in school, the daughter is college educated and ready for marriage. The most challenging time he faced was sometime around 1990 his body was totally paralyzed due to a misdiagnosed tumor on his neck; eventually some great doctors at a hospital in Lucknow operated on him and got rid of it before it became cancerous, and gradually over a few weeks he recovered his normal bodily motions and functions. Thanks to Zulekha Shariff and Atif Parker for donating this new Hercules to Rajkishore; Rajkishore in exchange gave us his very old bicycle which we donated to a teen from Rajasthan who arrived in Mumbai less than a week ago. Thank you Siddharth Vora of Kohinoor Cycles for the good discount and service.